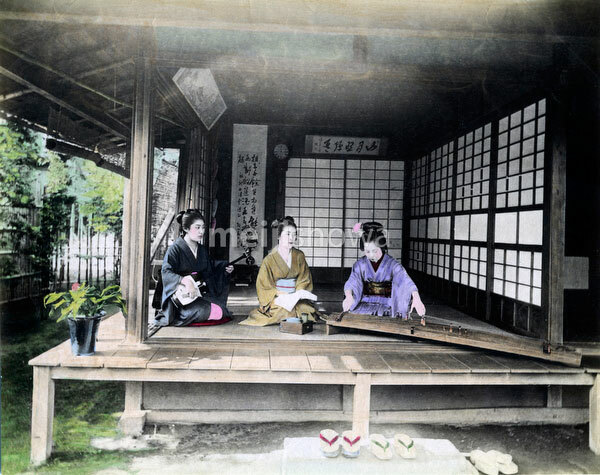 Young Japanese women in kimono and traditional hairdo are performing music in a traditional Japanese room with an engawa, a veranda-like extension of the house. One women is playing the koto (right), another the shamisen (left), while the woman in the middle is holding a book of songs. Geta are neatly arranged on the kutsunugi ishi (沓ぬぎ石), a stone for leaving the shoes. Part of the garden is visible.